Tarek Chemaly: Coca-Cola "stock up" for the FIFA World Cup. Coca-Cola "stock up" for the FIFA World Cup. 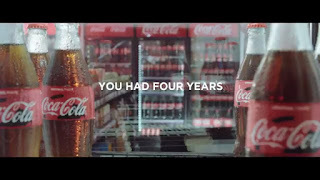 Coca-Cola pulls off a funny ad for the FIFA World Cup (well, I have seen many Coca-Cola ads for the World Cup ranging from the predictable to the mundane but this one is by far the funniest). And the punchline of "you had four years" is so majestically funny as fans are put down by their lack of unpreparedness. Watch the full ad here.